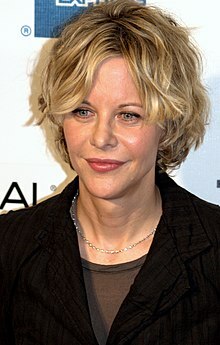 Meg Ryan (born November 19, 1961) is an American actress. She has starred in several romantic comedies, but has also worked in other movie genres, including drama and mystery. ↑ "Make that two! Meg Ryan and adorable daughter Daisy True sip identical drinks during afternoon shopping trip". Mail Online. April 15, 2013. Retrieved March 10, 2016. This page was last changed on 9 April 2019, at 01:09.